Simple display and/or with sensitivity HR x 10. Weighs accumulation (with up to 10 storage values). Additional rechargeable battery pack, for use the crane scale 24/7. 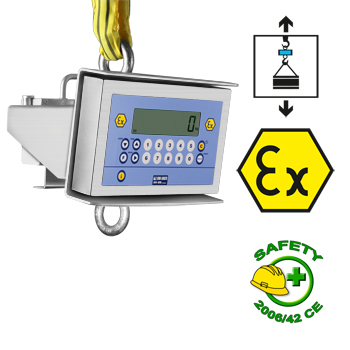 Industrial crane scales for use in areas classified as hazardous (Zone 1 and 21, 2 and 22) in accordance with ATEX II 2GD IIC T4 T197°C X protection. Structure completely in stainless steel, with IP65 protection degree. LITTLE SPACE IS TAKEN UP allowing the best use of the lifting devices. Predisposed for an upper connection ring and lower hook. Indicator with 17-key numeric-functional waterproof keyboard. Built extremely sturdy in IP65 stainless steel. Fitted with upper and lower shackle GR3 (GR6 for the 6T version). Adjustable digital filter, anti vibration and oscillation. Programmable auto switch-off power for energy saving. Hermetically sealed extractable rechargeable battery, with 160-hour operating time; rechargeable in safe area. Equipped with 230Vac 50 Hz battery charger to be used in safe area. Tare database (up to 10). ID1 and ID2 10-digit Codes. GOC3200 Fixed hook, MAX 3.2 t, with safety lock. GOA8 Fixed hook, MAX 8 t, with safety lock.